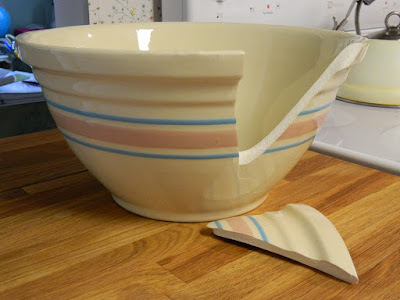 I was having "one of those days" this week, when a stack of bowls slipped out of my hands, sending my Most Special Bowl crashing to the floor--with this result. Did you know you can cry over the demise of an inanimate object? Bowl and I have had a long and very special relationship. Twenty-five years ago I spotted this lovely in an antique store and immediately had visions of perfect bread loaves I would knead to perfection in it. At $15, it was a bargain and thus began our memorable history together. Then came marriage, and a chief item in my hope-chest was Bowl. 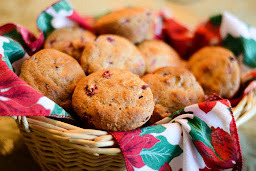 I pressed on in the discoveries of whole-grain baking, gluten-free bread dough, and large batches of cookies for years of various children's events. And of late, having learned about the nutritional benefits of soaking grains, Bowl has produced weekly batches of granola and homemade grape-nuts, sitting ornamentally on my kitchen counter and greeting me first thing in the morning with the promise of yummy healthiness. I am bereft. However, knowing that my treasures don't lie in earthly things, I must content myself with this little epitaph, and--of course--be on the hunt for Bowl Two. So sorry for your loss! My mom had one very much like it. I remember us using it for pancakes and bread too. I need to find one myself. I hope you have a successful hunt! And, I can't wait to get to Core 300 one of these days, like two years, I think! So sorry. I've actually lost items like that and it is hard. I've always wanted a bowl like that, but never found a good one. I hope you find one soon. I'm so sorry about your special bowl! But what a beautiful description of your history with this item - it really made me feel the keenness of the loss! May God provide an equally-good replacement soon. What a fitting memorial. How sad. It looks like a clean break & only one piece -- how about bowl meets Super Glue? :) I hope you can find a worthy replacement. I have a bowl like that, not as lovely, but very old. It was given to my uncle about 65 - 70 years ago from a wealthy family I know (he tested milk at their grandparent's homestead). It's the perfect reminder not to set our affection on things of earth, where thieves break through and steal, and where moth and rust (and breakage) corrupt.